Long-Term Care costs are getting higher. 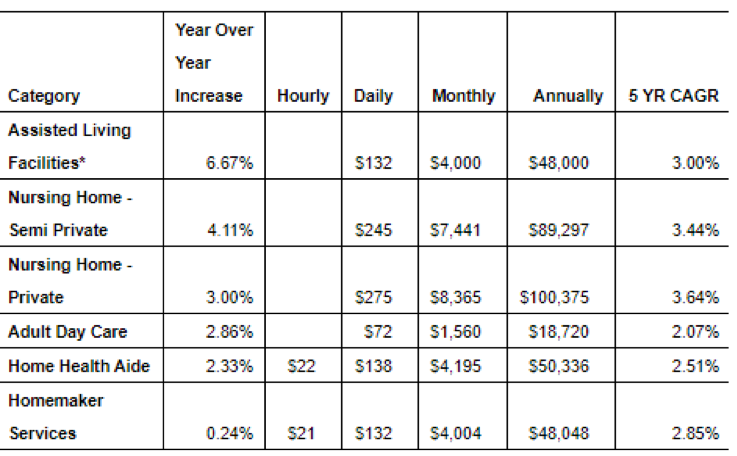 As labor costs increase the impact on your savings is even greater. Mary Ann sees this first hand when she processes claims. This experience can guide you as you plan for the financial costs and burdens that long-term care can bring to you and your family. If you are like most American families, you have family members who are living much longer lives. Longevity is not necessarily a bad thing, but it does dramatically increase a person's risk of needing long-term care services and supports. With a growing economy and record low unemployment, this is a combination which will directly impact your future retirement and the costs and burdens associated with long-term care. Men 20 and over: 3.4%. Lowest level since 2000. Women 20 and over: 3.3%. Matches a post-1960 low set in 2000. Asian-Americans: 3.5%. The record low is 2.1% in May 2018. African Americans: 6%. The second lowest rate in available data going back to 1972. The record is 5.9% in May. Hispanic-Americans: 4.5%. Matches an all-time low. Whites: 3.3%. Lowest since 1969. There will be 78 million people 65 years or older by 2035, compared with 76.4 million under the age of 18, according to the Census Bureau. By 2030, all baby boomers will be older than age 65. With advances in medical science, this creates a perfect storm. More people will need help with activities of daily living (things like bathing, eating, dressing, bathroom needs, etc.) or even supervision due to cognitive decline. With an ever-increasing demand for services and fewer people to provide these services, the costs of long-term care will continue to grow. The costs of long-term care services and supports haven’t gone up as fast as some other sectors in health care. But experts suggest as people continue to live longer, the demand for these services is outpacing the labor supply. Historically low unemployment with an ever-growing economy is also increasing the prices of this care which are labor intensive. According to the 15th annual Genworth 2018 Cost of Care Survey, which was just released in October, the blended annual median cost of long-term care support services has increased an average of 3% from 2017 to 2018, with some care categories exceeding two to three times the 2.1% U.S. inflation rate. Nationally, assisted living facilities saw the greatest increase, perhaps because of its popularity as a way to avoid a more institutional facility like a nursing home. Shortage of skilled workers. Genworth says the demand is outpacing the availability of providers. There are not enough workers to fill these roles compared to the huge increases in the number of people who require extended care. These caregivers know they can demand more, and companies are willing to pay more for the best workers. Also, fewer caregivers mean more overtime, which means consumers pay more for care. Higher minimum wages. The higher payroll along with changes in overtime pay rules places additional pressure on the bottom-line of many healthcare agencies in many states This increased cost of labor is hitting American families who require these care services. Difficulty attracting and retaining qualified workers. The expanding job market provides more job opportunities at higher pay. The role of a caregiver is a hard job and traditionally provides lower pay. Pay for these positions is increasing to counter the better job market. Business constraints. These care providers are seeing more regulations and other business constraints. These include differing laws on certification of caregivers, compliance obligations, razor-thin profit margins, balancing care quality and costs. Many states are increasing regulations. This makes it much more difficult to provide long-term care services and supports without increasing costs. Growing occurrence of Alzheimer's Disease and other dementias. Longevity is bringing a higher rate of those who suffer from cognitive decline. Supervision services for those with various forms of dementia often require more specialized care – and thus higher hourly wages. As more people live to older ages, the amount of the population who have cognitive decline increase substantially. Many aging Americans require specialized care services. Since many people don’t have Long-Term Care Insurance they wait too long to receive professional care. By then, there needs have progressed requiring more specialized services. More intensive levels of long-term care services and supports care are more expensive. Genworth has studied the cost of long-term care services and supports for 15 years. During that time Genworth says the cost of long-term care in assisted living facilities increased by 67%. Private nursing home costs increased by 54%. These costs are now 1.6% of the national median household income which was $62,685 as of August of 2018. While these facility costs have been going up, Genworth reports the annual cost of in-home care has remained relatively flat during those 15 years. Only recently, we a rapidly growing economy has the cost of labor impacted the cost of care at home. This has resulted in cost increases at a higher pace than previous years. Care costs have increased 19% for home health aides since 2004. This means planning for the financial costs and burdens of longevity is becoming an even bigger part of a family’s overall retirement plan. With a Long-Term Care insurance policy, a family will have tax-free resources to provide you with your choice of quality care in the setting you desire, either at home or in a facility. Generally, most policies provide an option for inflation protection. This way your benefits increase each year. Usually, the premium remains level even though benefits increase. Some plans provide for “future increase options”. With that option, your premium would increase if you elect to take an increased benefit. The Long-Term Care Partnership program requires a guaranteed automatic inflation benefit where the benefits go up each year, but the premium does not as it is already factored in the cost of the premium. Without Long-Term Care Insurance, the cost of care services will either drain your retirement savings or you will be forced to use family caregivers. Caregiving is hard on family members. Paid care is expensive and adversely impacts income and lifestyle. The best time to plan is prior to retirement when premiums are very affordable, and an individual’s health is usually good making the qualification for a policy easier. Start your online research by finding the cost of care in your state. The Genworth cost of care site is available by clicking here. The LTC NEWS MAP also has the cost of care but also includes information on available tax incentives, partnership availability and other state-specific information. You can find the LTC NEWS MAP by clicking here. The reality of needing some type of long-term care service in the future is high. Addressing the issue will safeguard your savings as it eases the stress and burdens usually placed on family members. Long-Term Care Insurance is very affordable for most people, but experts suggest speaking with a Long-Term Care Insurance specialist who works with the major companies. They should have a complete understanding of policy features, underwriting, partnership benefits, policy design, and claims. Very few insurance agents and financial advisors have this expertise. You can find a specialist by clicking here. The cost of this care will always increase. With a Long-Term Care Insurance policy in place, you have asset protection which gives your family peace-of-mind.